Tired of watching low-quality videos? Don’t get enough time to watch your favorite TV shows? The cable operator is not subscribing your favorite movie channel? You can always install a movie and video streaming application to get rid of these terrible problems. And when we are talking about the streaming applications, ShowBox is the undisputed king in this genre. Showbox comes with tons of recent and famous movies and TV shows, that’s too in HD quality and thus has garnered an immense popularity in the last couple of years. The application also allows its users to search contents by category and genre, which saves a great amount of time and reduces the searching labor. But the most standout feature of this streaming application is it supports streaming on Google Chromecast and Android TV. ShowBox is not the only streaming application available on the internet. You can try your hands on the other streaming applications too, particularly if you get bored of Showbox. So in this article, we will talk about the best alternatives of Showbox. We have made a list of the suitable Showbox Alternatives below, so check the list and download any one or two as per your wish. Playbox: Playbox is one hell of an app made specifically for film lovers. One can find the rarest of rare gems in the app if only one knows how to look for them by the user to filter options. And for all the premiere features the app has to offer, it comes completely for free. CinemaBox: Similar to ShowBox and Playbox, CinemaBox offers tons of movies and TV shows to cinephiles and suckers of a good TV show. They have got a huge collection to which they keep adding more latest movies and shows every week. You should totally check it out. Netflix: Showbox has a lot of advantages for being a free app, but you might face some problems for using an app which comes has third-party sources. We don’t think a paid service will ever come close to being as convenient as the Showbox app simply for the wide range of content the latter offers, but there is a reason why Netflix is so popular among entertainment lovers all over the world despite needing users to sign up with a credit card. The reason why we recommend Netflix is because while Showbox will eventually include everything after a time, you can watch all content on Netflix (both direct and affiliated) along with the rest of the world as they come. So unlike Showbox, you wouldn’t have to wait for the time until a particular series or a movie finally descends on the app. You can watch it as soon as it premieres. If you don’t mind shelling out money for a quality service, then Netflix truly has a delightful experience to offer. Popcorn Time: Popcorn Time provides a free alternative to subscription-based video streaming services. The list of media can be searched and browsed by categories and genres. It is a multi-platform, free software BitTorrent client that includes an integrated media player. When you click on a title, the film is downloaded via the BitTorrent protocol. Very much like other BitTorrent clients, as soon as Popcorn Time starts to download a film, it also starts to share the downloaded content with other users. The app continues to make the downloaded content available to others until the movie is deleted, which is generally done automatically once the app is closed. The interface of the app presents Thumbnails and film titles in a similar manner as of Netflix. MovieBox: MovieBox is the most popular and highly downloaded video streaming app among iOS users. Without a doubt, it is the best Showbox alternative for iOS users. It is basically an app which enables you to watch movies or TV series on your smartphone. Although this app supports Android OS, it is more fitted to iOS devices. Moviebox is another movie streaming application which has been famous in recent times. With this media app, you can also download TV shows, HD quality music videos, and popular movies. The application supports various kinds of video formats like flv , mp4 , mkv ,wmv. You can also watch the movie teasers and IMDB ratings through Moviebox. This streaming application is available on Android and iOS. Playbox HD: Playbox HD, a perfect substitute of Showbox, allows you to stream and download popular HD quality movies, TV shows, and music videos. The application comes with a user-friendly interface and hailed as one of the best movie streaming applications for free of cost. Crackle: Like Showbox, Crackle is also a movie and video streaming application which comes with thousands of HD quality movies, music videos, and TV shows. This application is available on both Android and iOS. Flipps TV: Just like Showbox, Flipps TV also supports Chromecast and you can watch popular movies, TV shows, cartoons and music videos directly on your TV set. The application is available on both Android and iOS. DirecTV: The last name on the list of ShowBox alternatives is DirecTV. This popular streaming application lets its users to watch the latest HD quality movies, TV shows, and music videos. Just like Flipps TV, DirecTV also supports Chromecasting, so that means you can watch this contents directly on your TV set. The application is available on both Android and iOS. 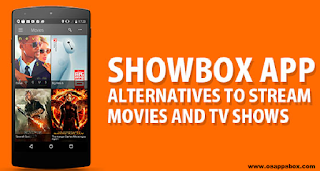 Wrap UpSo friends, here goes our list of the best alternatives of Showbox. Choose one as per your wish and download it on your handset as the perfect Alternatives of ShowBox.